Cold Spring has been retained by an 80 year old retired judge who suffered a $106,000 loss with a New York based broker dealer. His broker had put his account on margin without his knowledge or consent. Despite the clients profile which stated he was a conservative investor, the broker over consentrated his account with speculative high risk positions and unsuitable investments for a man his age. Almost half of the clients losses were attributed to commissions charged by the broker. Cold Spring has been retained by a 57 year old farmer from Iowa seeking $877,000 in damages against a Manhattan based broker dealer. This firm made unsuitable recommendations, over concentrating his account and heavily trading options despite the clients limited investement experience. The broker also charged enormous commissions that were hidden from the client due to marking the stock up or down on the actual cost. 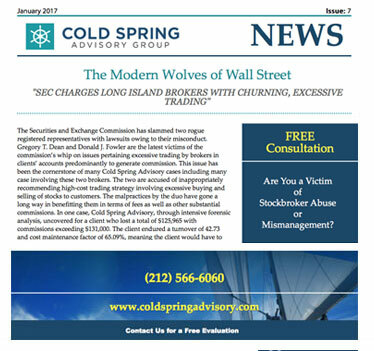 Cold Spring has been retained by an 80 year old retiree from California who lost $230,000 with a New York based broker dealer who made unsuitable investment recommendations. His account was traded excessively with speculative stocks unsuitable to his investor profile. The broker hid his commissions with mark ups and mark downs so the client had no idea what he was really being charged. Cold Spring has been retained by a 59 year old US Postal Carrier in Houston Texas, seeking $77,000 in damages against a Woodstock, Georgia based broker dealer. His broker over concentrated his account and had him in unsuitable investments. This broker would also sell positions only to buy them back shortly thereafter, soley to generate commissions. This broker also charged him excessive commissions and churnned his account. Cold Spring has been retained by a 63-year-old farmer from Sioux Rapids, Iowa seeking $110,000 in damages against a New York-based brokerage. His broker cover-concentrated his account in highly speculative positions despite his lack of investment experience and excessively traded his account to generate commissions. Cold Spring has been retained by a 60-year-old farmer from Lakin, Kansas seeking $295,000 in damages against a Woodstock, Georgia brokerage. His broker churned his account solely to generate commissions and over-concentrated him in speculative positions despite his lack of investment experience. Cold Spring has been retained by a project manager in Fenton, Michigan seeking $73,000 in damages against a New York-based broker-dealer who traded his account solely to generate commissions. His broker made unsuitable investment recommendations and placed him in highly speculative positions despite his investment objectives. Cold Spring has been retained by a real estate developer in Columbus, New Jersey seeking $45,000 in damages against a Madison, New Jersey broker-dealer. His broker placed him on margin without authorization and over-concentrated him in highly speculative positions. The investor lost approximately 75% of his investment in a single year and was charged $20,000 in commissions by his broker. † The FINRA name and Broker Check are registered trademarks of Financial Industry Regulatory Authority, Inc. The trademarks are used in accordance with its trademark policy and do not signify sponsorship or endorsement. COLD SPRING ADVISORY GROUP, LLC IS NOT AN ATTORNEY OR LAW FIRM. WE DO NOT PROVIDE YOU WITH ANY LEGAL ADVICE. © 2015 Cold Spring Advisory Group, LLC. All rights reserved.